The World Bank and the e-Agriculture community are collaborating together in a series of online forums to further develop resources for the recently launched “ICT in Agriculture” Sourcebook. These discussion forums, available to all e-Agriculture community members, will be vehicles to inform the World Bank of other projects/programmes that e-Agriculture members are carrying out and that could complement the research of the World Bank. The ICT in Agriculture Sourcebook offers practical examples and case studies from around the world. 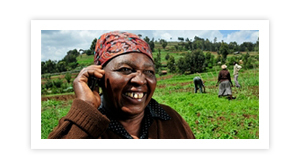 A compilation of modules related to 14 agricultural subsectors, each module covers the challenges, lessons learned, and enabling factors associated with using ICT to improve smallholder livelihoods. Its aim is to support development practitioners in exploring the use of or designing, implementing, and investing in ICT enabled agriculture interventions. e-Agriculture will be hosting the first of these forums to look at Strengthening Agricultural Marketing with ICT. Sourcebook module 9 begins with an overview of the need for and impact of ICTs in agricultural marketing, especially from the perspectives of producers, consumers, and traders. Specifically, the forum will look at mobile phones as a marketing tool; evidence that ICT is changing logistics and transaction costs; the use of ICTs for market research (both for acquiring immediate market information and acquiring market intelligence over time); and the use of ICTs to make input supply and use more effective. This is a unique opportunity to share with the World Bank and others around the world your own case studies, challenges you have faced, and leading trends that other practitioners may not be aware of. To participate in the forum, you must be a registered with the e-Agriculture community. All e-Agriculture forums are asynchronous conversations, and run non-stop for their two week duration. It is possible to log on at any time from anywhere to participate.